The King of Cuban dishes is here: Ropa Vieja! Ropa Vieja is a traditional Cuban dish and perhaps the main Cuban comfort food dish that many know. Many go crazy for this dish and you know it’s a good day when Ropa Vieja which is a Braised Shredded Beef Brisket is on the menu! There’s nothing more delighting than coming home and seeing that someone has whipped up Ropa Vieja, Cuban Black Beans, White Rice, and Maduros for dinner. It’s the sign of ultimate love and admiration. At least, that’s how I feel whenever I make this dish for friends and family. It’s a tedious and time consuming dish whose rewards are all worth it in the end. Now there are three dishes that I am known for amongst my friends and family. They include my Pernil Dominicano, my Ultimate Baked Mac & Cheese, and my Ropa Vieja! 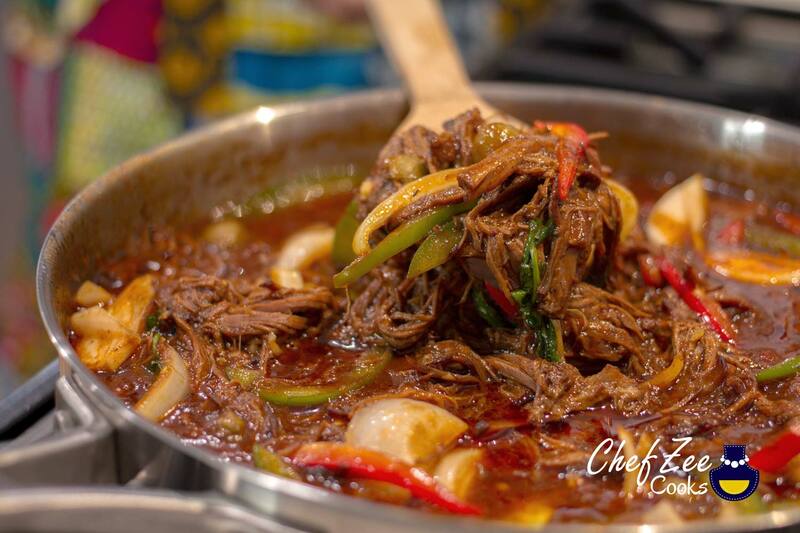 Funny enough– many have proposed after having my version of Ropa Vieja! Now with that being said, there are a ton of ways of making this dish and over the years, I’ve tweaked and remixed it and I’ve landed on a dish that’s to die for! To start, I used Brisket because it’s affordable, feeds many, and the beautiful marbling throughout the meat gives you a meat that’s unparalleled in flavor and texture! I truly believe that brisket is one of the best cuts of meat– period! You can transform that meat to practically anything and it holds flavor amazingly. You can season this meat liberally without fear and you will not mess up! I wouldn’t say that brisket is beginner friendly, but for novice cooks looking to dive head first into braised meats and stews– brisket will not disappoint! Ropa Vieja tastes better the next day. You can stew the onions and peppers at the end for as long as you wish. I like to stew them just for a minute or so since I like my onions and peppers on the crunchy side.